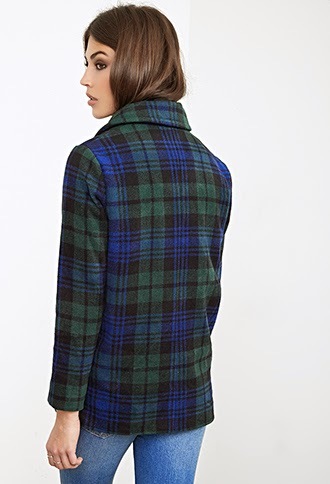 My favorite coat at the moment is a Plaid Flannel Overcoat I recently purchased at Forever 21. The weather has been strange this year. Really strange. So this coat was perfect. I found my normal Winter coat waaaaaayyyyy too warm this year so I needed something that would still be warm enough for the occasional snowstorm, but wouldn't leave me completely sweating on a day to day basis. This coat should still be available and was on sale, so that was major bonus points in my book. I wanted to snap a few pics in it but ended up not having anyone who could take photos for me, so I've posted a few snapshots below of the model wearing the jacket on Forever's website. Since she does a much better job than I would have modeling the coat, I suppose things worked for the best! 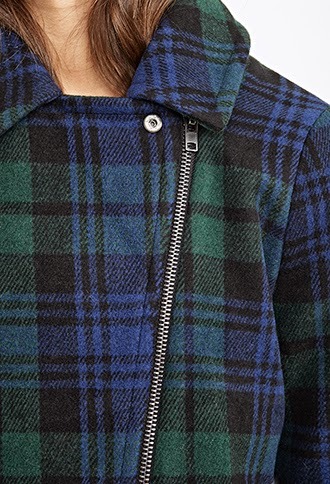 The jacket has a moto-cut feel to it which is one of my favorite details! The sleeves are a bit longer on me, but all the better to keep me warm. The fit is true to size and the material and cut make the jacket look much more expensive then it really was! You can find the jacket here. Let me know what you've been wearing out this Winter.